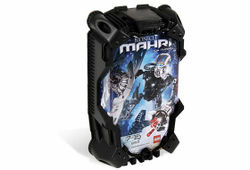 8913 Nuparu is a BIONICLE set released in 2007. He is one of the six Toa Mahri. He comes with the Mask of Stealth, a shield, and a Cordak Blaster. This is Nuparu's third appearance in a set. In the BIONICLE Universe, he is a Toa of Earth. This is a description taken from LEGO.com. Please do not modify it. (see an archive of the product's page) He strikes from the darkness! From out of the shadows of the Pit swims Toa Mahri Nuparu to fight the evil Barraki! His aqua blaster blade sends shockwaves through the Pit, while his shield protects him from attack. Using his Mask of Stealth, Nuparu can move almost unseen, then fire his Cordak blaster at a foe! Nuparu stands over 7" (18 cm) tall! He strikes from the darkness! This page was last edited on 15 August 2016, at 02:42.